What is the heart of the conflict in your book? What's truly at stake? It's bigger than just defeating the bad guy—there's the battle that your MC is facing within herself, the battle to become the heroine she is meant to be. In my previous post, we discussed the MC's internal goal versus the external goal. I think the heart of the conflict, the true conflict, is usually found in the relationship between those two goals. The internal goal might be in direct conflict with the external goal, or perhaps the external goal simply doesn't help with the internal goal. Sometimes, they do go hand in hand, but not in the way the MC expects. Exploring this relationship is a strong way to end a query because it's often the very thing that motivates readers to keep reading the manuscript. Let's return to our Harry Potter example from the previous query tips posts. Harry's internal goal is to find family. He actually has two external goals: a long term goal of defeating Voldemort, but a short term goal of discovering the mystery behind the three-headed dog. He suspects that the two external goals might be related when his lightning-shaped scar burns at various points. But how do his external goals relate to his internal goal of finding family? For one thing, Harry has quickly realized that Hogwarts is a sort of family. Part of his motivation behind unraveling the mystery is simply to protect this school he's found a sense of belonging at. And as Harry works with Ron and Hermione to stop the villain, his two good friends become closer to him than any of his true family ever were. When his lightning-shaped scar begins to burn, Harry wonders if he should heed the warning to keep his friends out of danger. But perhaps true friendship means they must risk everything together—including their lives—to keep their newfound home at Hogwarts safe. Here I've tried to show the inherent conflict between his internal and external goals. To solve the mystery (external goal), Harry must risk his friends (internal goal). But if he backs off to keep his friends safe, he might end up losing Hogwarts and his new family anyway. The only way he can actually keep Hogwarts safe is to work with his friends, which makes them even more tightly knit. 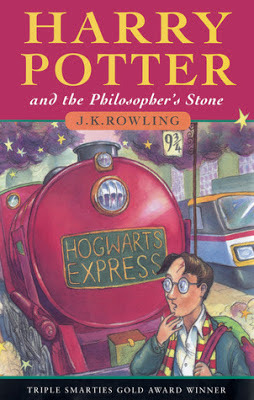 Eleven-year-old Harry Potter has been sleeping in a cupboard ever since he arrived on his relatives' doorstep as a baby with a scar on his tiny forehead. Although his aunt and uncle spoil their own son Dudley with thirty-seven presents on his birthday, Harry receives something far more special for his. A letter from a school called Hogwarts, claiming that Harry is a wizard. The Hogwarts School of Witchcraft and Wizardry introduces Harry to a world of potions, magic wands, and quidditch, a sport played on flying broomsticks. But when Harry discovers a three-headed dog guarding a trapdoor in an area forbidden to students, he realizes that his teachers aren't telling him everything. Now Harry and his friends are determined to find out what might be valuable enough for such drastic security measures—and what it might have to do with a break-in at the wizard bank, a professor's mangled leg, and a troll set loose in the school. This clocks in at 200 words. We've covered the major themes and conflict in Sorcerer's Stone, but left quite a bit of mystery. Notice we haven't mentioned Voldemort directly, but by including the scar in the first and third paragraph, we've brought everything full circle and indicated that there might be a connection between the three-headed guard dog's mystery and Harry's past. Again, we're teasing the reader. There's no one formula to write a query—in fact some of the best ones break all of the rules. For HP, I think you could have written a query that focuses solely on the inciting incident, when Harry receives the letter. Still, I hope these examples give you some ideas on how to break down the most compelling aspects of your book and have the agent or editor begging for more. If you missed the previous examples, start with Step 1: Introduce Your Character With Subtext. Or continue to Step 4: Polish With a Goal Toward Readability. Logo/Header by Fabler & Design. Simple theme. Powered by Blogger.